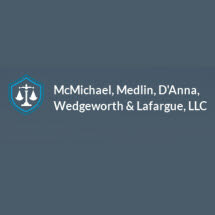 McMichael, Medlin, D'Anna, Wedgeworth & Lafargue, L.L.C. is a full service law firm with a broad commercial, tax, succession, estate planning and litigation practice. Founded in February, 1999, the firm has earned a reputation in Shreveport, North Louisiana and the surrounding area for providing high quality, result oriented and efficient legal services. It was awarded, and has maintained, an AV rating from the Martindale-Hubbell legal directory since its inception. This firm's client base reflects a broad range of individuals and business, including those engaged in manufacturing, real estate, banking, oil and gas title work, health care, the service industries and other commercial activities. The firm's litigation practice is focused in the federal and Louisiana state courts and administrative agencies within the federal government and the State of Louisiana . The firm's lawyers have experience in commercial and business tort litigation, anti-trust litigation, toxic tort and environmental litigation, insurance coverage disputes, construction litigation, bank litigation, intellectual property litigation, health care litigation, all phases of corporate litigation, including contract disputes and representation of corporate officers and directors, employment litigation, personal injury litigation and bankruptcy and foreclosure litigation.